I've had some gut-wrenching plane landings (and take-offs) in my days. The first as a young medical student flying with a bush pilot to remote First Nation (American Indian) villages in Western Ontario. The plane was outfitted with large skis so that it could land and take off from frozen lakes or rivers. Unfortunately we were traveling at the time of the spring thaw and the ice was starting to melt. Landing on the puddle dotted ice was bad enough, but the feeling of the plane trying to accelerate as it kept dropping down and breaking into the soft ice still gives me nightmares as I thought we were done for (thought the pilot wasn't phased in any way and referred to me as a p***y (grown up kitten). Some 15 years later while in a single prop plane traveling from Adelaide to Kangaroo Island in Southern Australia, the pilot told us we were about to land and started rapidly descending. We couldn't see anything except green pastures and about a thousand sheep below us -- not a road or runway anywhere. With the noise of his engine increasing, the sheep ran away and cleared a small mud strip on which we bounced down. It was really a fairly smooth landing but that idea of landing in a flock of sheep bothered me, though not as much as the ice plane. And there are many episodes of turbulence and such. But the most amazingly improbably runway I've ever landed on was at the Lukla Airport in Nepal, also known as the Tenzing-Hillary Airport (in honor of the two men who first conquered Mt. Everest, Sir Edmund Hillary and Sherpa Tenzing Norquay). This is a small landing strip Sir Edmund helped develop to ease the journey of tourists in to the Khumbu region of Nepal, including the Mt Everest Base Camp. The only other option for a Nepalese approach to Everest is a long road journey from Khatmandu. The airport is extremely important to the economy of the Sherpa people as not only does it bring tourists into the region, almost all hard goods needed here (from food to building supplies) also need to be flown in. But it is far from an ideal landing strip. As you fly from Kathmandu to Lukla, you're traveling in the dramatic Himalaya -- Beautiful! Most people wonder where in this vertical landscape they might put a landing tarmack. 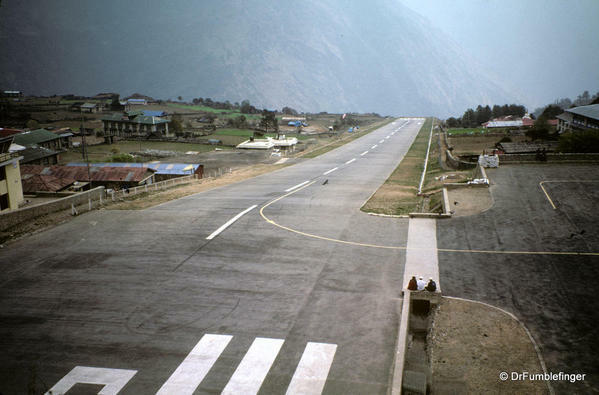 As you near Lukla, you begin to see a very tiny short strip of runway that ends at the base of a tall mountainous cliff. The runway just doesn't seem long enough. There's another cliff at the beginning of the runway, so really the landing strip is on a narrow shelf of land and you're landing not on the long axis of the shelf but the short one. If your pilot falls short of the runway, there's a drop-off of hundreds of meters. If he can't break the plane when it's landed or over overshoots the runway, well, you get the picture. Once the pilot commits to landing there's not enough room to fly out of it, so one way or another you land. You, as a passenger, are completely dependent on the skill of you pilot and the soundness of his aircraft to land you safely, but I suppose that's true at all airports. Obviously we made it and most people do, but it was a dramatic scene to experience first-hand. You can get a feel for what this is like when you watch this video. Take offs are equally exciting and its very important that your plane is not overloaded. Planes brake as their engines built power, then sprint to the end of the runway. If there isn't enough lift, their plane will plunge, slowly gaining altitude and gradually emerging above the horizon. It's a little scary but the planes to do alright, even if they disappear from view after takeoff. A television show entitled Most Extreme Airports rated this airport as the most dangerous airport in the world in 2010. You can view their 13 minute analysis of the airport here, which if you enjoy air travel makes some interesting viewing. Planes can only fly during day and in good weather, although it gets turbulent when its clear and you can't see to land when it's cloudy or foggy, so conditions never seem great. Some technical aspects of the airport: The elevation of the airport is 2,800 m (9,200 ft). The runway is less than a half kilometer long with a 12% grade (uphill as you land, downhill as you take off) and is only suited for helicopters and the very few aircraft designed for short take-offs and landings like the De Havilland Canada DHC-6 Twin Otter plane. Would I fly there again? Yes, definitely. 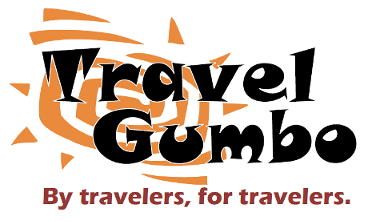 The Khumbu and the Sherpa people are worth visiting whatever small risk the airport presents. But I wouldn't look forward to a Lukla landing with any pleasure at all. Your pictures remind me very much of the Shimla Airport, same end of runway in space, same commitment required by pilot and passengers alike. The plane was tiny, I sat immediately behind the pilot, a Sikh with headphones perched atop his turban rather than over his ears, unique in my experience. The view was a bit too immediate for my liking but we made it off just fine and bounced in the heat all the way to Delhi. Thanks for the memory, DrF. I try not to let any aspect of travel faze me, but I'm perfectly happy to have watched the video and call it a day on that one!